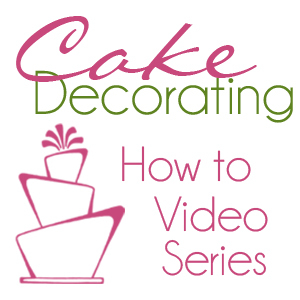 One of my goals as a cake decorating blogger is to help YOU be able to make amazing cakes for your parties and kids. It’s the whole reason I started cake decorating- to make my kids cakes. And while I’m happy to make and sell my cakes I charge what my time and talent is worth, and often that’s simply too much for most people. And as much as I enjoy making cakes I prefer making them for my family and friends. So I want to help make cakes so you don’t have to hire someone like me to have a fun centerpiece! What other techniques would you like to see video’s on? Using the silhouette? Carving cakes? Topsy Turvy cake carving? Fondant or Buttercream flowers? Or both? Frosting cupcakes? Using my paint gun to spray paint cakes (edible of course)? Please please PLEASE tell me if you enjoy this at all and what else you’d like to see! I hope this becomes a fun feature for us all, and if not I’ll stop where I am. I think this is a great series. I love the tip about making sure the lines aren’t the same direction… I never thought of that while decorating. Thanks so much! I hope it goes over well. I’ll add carving cakes to the to do list! Anything in particular you’d like to learn to carve? Topsy Turvy cakes? Shapes like the pumpkin cake?